Is Hugo Broos Rebuilding Indomitable Lions? Signed in February 2016 by Cameroon, the Belgian tactician went on to win the African Nations Cup, AFCON 2017, had a shameful show at the FIFA Confederation Cup and failed to qualify for the 2018 World Cup. Since the Lions’ triumphant success at the 2017 AFCON, they have been limping then under the tactician who has constantly called on Cameroonians to be patient for he is building a squad ahead of 2019 AFCON in Cameroon. The Post looks at the evolution or the stagnation of the Indomitable Lions under the Belgian tactician since he took over the helm of the Indomitable Lions. Since assuming control of the Indomitable Lions, many players have decided to leave the once roaring team that brought so much glory to the African continent. 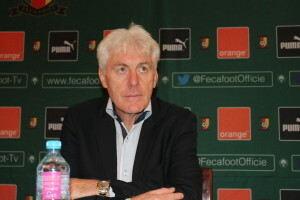 In one of his press conferences, the Belgian lamented the fact that players do not want to play for Cameroon. “I can’t explain why players don’t want to come and play for the national team, if the reason is because they don’t play, then, they are not professional,” Broos said. Players like Andre Onana, Allan Nyom, Karl Toko Ekambi, Eric-Maxim Choupo-Moting, Nicolas Nkoulou, among others, have all made themselves unavailable. All these are players who are in the starting XI of their clubs and are still in their 20s. Also, a good number of players have turned down the opportunity of representing their fatherland under helm of Broos. Players like 25-year-old French Ligue 1 side Bordeaux left-back, Maxime Poundje; 24-year-old midfielder, Ibrahim Amadou, who plays with Lille OSC in France, among others, have all turned down calls to represent Cameroon for the first time. These players play an integral role in their respective clubs and looking at their ages, they are a good for the reconstruction of the Indomitable Lions. One would have expected that, with the poor run of form during the 2018 World Cup Qualifiers and the FIFA Confederations Cup, they would have been an overhaul in the den. Sadly, this has not been the case as same names still continue appearing despite poor results. This goes against the football science which gives room for changes when the team is in poor run of form. Football pundits were expecting that games like the last two World Cup qualifiers against Algeria and Zambia would have been used to give opportunities to players who have not made their debut for the Indomitable Lions. Worse still, for a coach building a squad, one would have expected to see Cameroonians excelling in football abroad given the opportunity to showcase their talent. Players like Gaetan Bong (defender, England, Brighton & Hove Albion), 24-year-old Macdonald Ngwa Niba (defender, Slovakia, FC Nitra), Léandre Tawamba (Striker, Serbia, Partiza), 18-year-old forward Nelson Mandela Mbouhom (Germany, Eintracht Frankfurt), Franklin Wadja and many more are yet to be given the opportunity. On many occasions, players have come out to say they never said they won’t play for Cameroon. Incidents like those of Karl Toko Ekambi and Andre Onana who have all debunked claims by Hugo Broos that they have refused to play for their nation, are all raising eyebrows. A reconstruction process that is witnessing some lack of trust as far as the parties are concerned, will surely face challenges that can stall it. Since taking over in February 2016, Broos has used almost the same team both in desperate times and less pressure times. However, Broos has brought in some talented players into the Lions’ den. Players like Arnaud Djoum, Abang Anatole,Andre Onana, Michael Ngadeu Ngadjui, Jean Pierre Nsame, Zambo Anguissa, Adolphe Teikeu, Moumi Ngamaleu and many more, all in their 20s, have had their first call ups under the Belgian tactician. He was able to make the Indomitable Lions roar once more after more than a decade of being in the wilderness. Under Hugo Broos, from October 9, 2016, Indomitable Lions have played 22 games, registering 9 clean sheets, seven draws, scoring 26 goals, conceding 23 goals and going for five games without a goal in a game. They have also after a long while, suffered 4-0 humiliation twice under Broos in games against Columbia and Nigeria. They also registered a run of four games without a single win from June 13, 2017.